We loved these invites sent out recently by Kay, Tony, Lorraine and Lee. 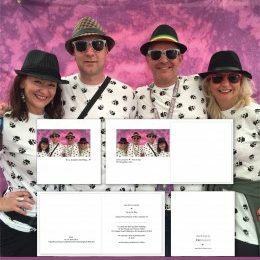 They were having a fun double wedding and used a great photo of the four of them at recent festival for their invites. They wanted to use a heart on their invites and we coloured it to match the background of their photo so it all tied together really nicely. Enjoy the fun its going to be one heck of a party!